Our Resilience Infographic includes a section on the benefits of building resilience demonstrating why it is a great skill to have in today’s changing environment. It also provides some facts about learning resilience and reasons why this key life skill is worth some time investment. Please share if you find it useful. There are many reasons for improving and building on our own personal resilience. What are yours? Resilience is the human capacity to face, overcome and be strengthened, and even transformed, by experiences of adversity. Resilience can be learned. All humans have the capacity to become resilient – everyone is able to learn how to face the inevitable adversities of life. Resilience is all about your response – managing your mind-set and emotions, being proactive and cultivating high self care. When we build resilience we can weather the most severe storms. Resistance is inflexible, frozen, stuck and acts as a barrier to change – it holds back progress. Resilient people see the opportunity in change and can thrive in a changing environment. Being in a reactive state is the opposite of resilience. It creates greater risk of physical illness as well as emotional distress. The more time you spend in a reactive state the more t becomes the norm. Resilience is developing the ability to respond instead of react. Being able to create a new vision and see a better future enables the realistic optimist to be determined and persist in taking positive action, DESPITE obstacles and setbacks. So, what are the benefits of building your own resilience? You can learn to become aware of what your triggers are so you can learn to RESPOND instead of react. Did you know you always have a choice? Making no choice is a choice! 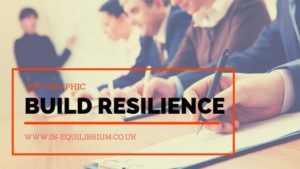 Resilience training helps you to develop your decision making and problem solving skills so you feel more confident and in control of what happens. You can learn to increase empathy through trust. To increase empathy is to gain trust and trust is the basis of all healthy relationships. Being mindful to the present moment is a great help when you are trying to come out of the reactive mode into the responsive mode.